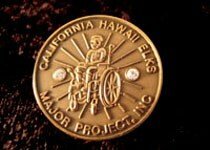 Make a Donation to California-Hawaii Elks Major Project, Inc. Your gift today will help hundreds of children with disabilities throughout California and Hawaii to Walk, Talk, See and Play! Donations are welcomed in any amount or you may want to choose to join one of our exclusive clubs and receive a special thank you. Join one of three exclusive clubs and receive a special thank you from the Major Project! Become a member of the 52 Club, Century Club and/or Millennium Club and receive a special Pin and a Certificate personally signed by the CHEA President. These are good programs for posting names in the Lodge bulletin of Millennium Club, Century Club and 52 Club members. Also, it is recommended that a list of names be placed in an area of prominence in the Lodge to stimulate interest. This is also a good program to introduce to Elk spouses involved in Bowling, Emblem, RV, etc. 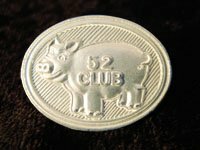 A member donates one dollar a week to the 52 Club. This can be done all at once by giving $52, or in various increments as the Lodge sees fit, i.e., $1 a week or any other amount until the Lodge receives $52 from the individual. When the Lodge receives the $52, a check is made out and must be sent to the CHEMPI office in Fresno along with the member, spouse’s or friend of the Elks name and Lodge name and number. When CHEMPI Receives the money, a certificate will be issued, along with a special 52 Club silver pin. The certificate will be signed by the CHEA President and forwarded to the Lodge for presentation. The Lodge will get credit in its Piggy Bank account for this donation. The intent of this program is for a member to belong to the 52 Club by repeat donations. 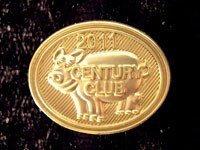 The Century Club is an exclusive club for Elks and their spouses or friends of the Elks who donate $100 to the Century Club. This is done either through the Lodge or directly to the California-Hawaii Elks Major Project, Inc.
A check is made out and must be sent to the CHEMPI office along with the members, spouse’s or friend of the Elks name and Lodge name and number. When received in Fresno, a certificate will be signed by the CHEA President and along with a special Century Club gold pin, sent to the Lodge for presentation. Cash or a check, along with the donor’s name and Lodge name and number can be given directly to any CHEMPI Trustee, the Association Piggy Bank Chairman or Vice Chairman, or the Lodge. They will forward this to Fresno for the donor. A list of Century Club members will be published in “The California-Hawaii Elk” magazine. The intent of this program is for a member to belong to the Century Club by repeat donations. The Millennium Club is an exclusive club for individuals who, beginning April 1, 2001, achieve an accumulated donation amount of $1,000 to the California-Hawaii Elks Major Project, Inc. (CHEMPI). This is accomplished when the Fresno office has received an accumulated total of $1,000 directly to CHEMPI. Donations included in the accumulated total are memorial donations, general donations, magazine holiday greeting card donations, Century Club donations and 52 Club donations. 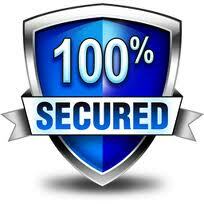 Not included in the total are Bequest and Living Trust donations nor label/card program donations. A check or series of checks is made out and sent to the CHEMPI office along with the name of the member or spouse and Lodge name and number. When $1,000 has been received in Fresno, a certificate will be issued and signed by the CHEA President and sent to the Lodge for presentation, along with a special Millennium Club gold pin. The determination of who is eligible for such an award will be based upon the records maintained in the CHEMPI office in Fresno. Cash or a check, along with the donor’s name and Lodge name and number, can be given directly to any CHEMPI Trustee, the Association Piggy Bank Chairman or Vice Chairman, or the Lodge, which must be forwarded to the Fresno office for credit to the donor and Lodge. A list of Millennium Club members will be published in “The California-Hawaii Elk” magazine. This program is not based upon donations for a single year, but upon the accumulated total received in Fresno since April 1, 2001. Our purple piggy bank has been the symbol of giving by the Elks of California and Hawaii since 1950. 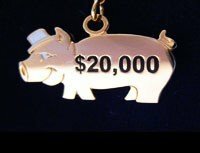 Donors accumulating up to $2,000 receive a Purple Pig ($2,000) to wear alone or with their Millennium Club pin. Donors also receive a Special Certificate honoring their donation. Donors names will also appear in the next issue of The California-Hawaii Elk magazine. This level recognizes individuals who understand the vision of our early Elk members who were instrumental in the initiation of the Major Project Program. 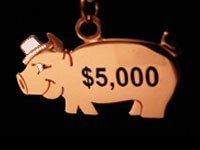 Donors accumulating between $5,000 and $9,999 will receive a Bronze Pig ($5,000) to wear alone or with their Millennium Club pin. They will also receive a beautifully customized walnut plaque with their name and Lodge engraved on bronze plate. Donors names will also appear in the next issue of The California-Hawaii Elk magazine. This level recognizes individuals who have made a difference in the lives of children changed forever through the work of the therapists and pediatric vision screeners they support. 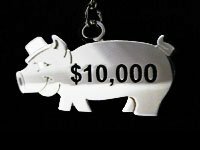 Donors accumulating between $10,000 and $19,999 will receive a Silver Pig ($10,000) to wear alone or with their Millennium Club pin. They will also receive a beautifully customized walnut plaque with their name and Lodge engraved on silver plate. Donors names will also appear in the next issue of The California-Hawaii Elk magazine. This level is the highest recognition bestowed upon an individual. The individuals demonstrate their loyalty and commitment of generosity so that the children we serve can “Walk, Talk, See and Play.” Donors accumulating $20,000 and over will receive a Gold Pig ($20,000) to wear alone or with their Millennium Club pin. They will also receive a beautifully customized walnut plaque with their name and Lodge engraved on gold plate. Donors names will also appear in the next issue of The California-Hawaii Elk magazine. For additional donation forms and information follow the links below. Want to be a Recurring Monthly Donor? Click here to see more. …or any amount you wish to enter.